A 300-year drought may have caused the demise of several Mediterranean cultures, including ancient Greece, new research suggests. A sharp drop in rainfall may have led to the collapse of several eastern Mediterranean civilizations, including ancient Greece, around 3,200 years ago. The resulting famine and conflict may help explain why the entire Hittite culture, chariot-riding people who ruled most of the region of Anatolia, vanished from the planet, according to a study published Wednesday in the journal PLOS ONE. 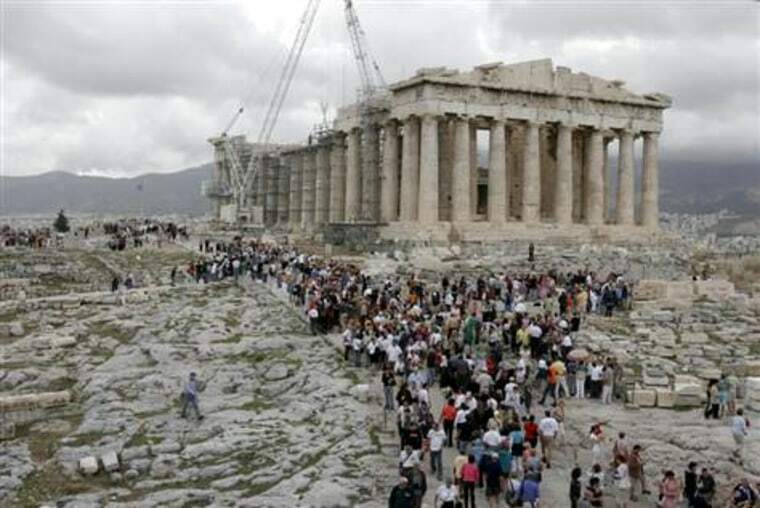 "The classical Greek folks knew from the very beginning that they were coming out of a dark age," said Brandon Lee Drake, an archaeologist at the University of New Mexico, who was not involved in the study. The ancient Hittite empire of Anatolia began a precipitous decline around 3,300 B.C. Around the same time, the Egyptian empire was invaded by marauding sea bandits, called the Sea People, and the ancient Mycenaean culture of Greece collapsed. Over the next 400 years, ancient cities were burned to the ground and were never rebuilt, Drake said. But the cause of this Bronze Age collapse has been shrouded in mystery. Some archaeologists believed economic hardships caused the demise, while others proposed that massive tsunamis, earthquakes or a mega-drought was the cause. Past studies looking for drought typically only found evidence showing it occurred for short periods of time, making it hard to make conclusions about the whole period, Drake said. Toward that end, David Kaniewski, an archaeologist at the University of Paul Sabatier-Toulouse in France, and his colleagues collected ancient sediment cores from Larnaca Salt Lake, near Hala Sultan Tekke in Cyprus. The lake was once a harbor, but became landlocked thousands of years ago. A decline in marine plankton and pollen from marine sea grass revealed that the lake was once a harbor that opened to the sea until around 1450 B.C., when the harbor transformed over 100 years into a landlocked lagoon. Pollen also revealed that by 1200 B.C., agriculture in the area dwindled and didn't rebound until about 850 B.C. "This climate shift caused crop failures, dearth and famine, which precipitated or hastened socioeconomic crises and forced regional human migrations," the authors write in the paper. The results bolster the notion that a massive drought caused the Bronze Age collapse, Drake said. "It's getting hard to argue that there wasn't as significant change in climate at that time," Drake told LiveScience. Famine may have caused the huge migration of people en masse — which may be the reason that the mysterious Sea People who invaded Egypt brought their families along, Drake said. As ancient cultures battled for dwindling resources, they burned the great cities of the day to the ground. In the heart of these dark ages, the ancient Mycenaens lost their writing system, called Linear B, and correspondence between countries slowed to a trickle, Drake said. Ironically, those who suffered through those dark times may not have realized the cause of their misery. "It happened over 200 years. People may not have even recognized the climate was changing, because it was happening so slowly over their lifetime," Drake said. Follow Tia Ghose on Twitter and Google+. Follow LiveScience @livescience, Facebook and Google+. Original article on LiveScience.